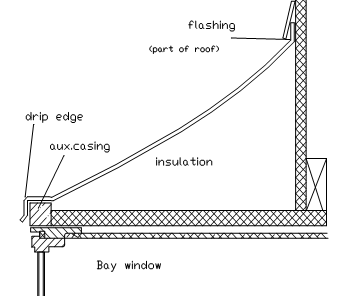 Polymer roofs are designed to be installed with auxiliary casing provided by window manufacturer or others(on some windows this may already be part of the window).See illustration below. This casing is sometimes no more than a piece of 1”x1” pine to fill in the space between the platform or head board and the outer edge of the window and is used to provide fastening for the roof. Sometimes this piece could be a little wider to better fill in the space between the window and the roof. 3, Attach roof to auxiliary casing with the screws provided.